Villa Clearwater, Barbados. Set along the famed Platinum Coast that is western Barbados is the remarkable Villa Clearwater. Tucked right along the sands of famed Gibbs Beach, it is a rare and remarkable find. A contemporary design and the use of coral stone makes it a visual delight, and set in its own private gardens and grounds, it will provide visitors with an abundance of lush outdoor spaces to explore and savor. For many, though, it is the fact that it is just steps from the sands and offers what is easily one of the most relaxing and enjoyable retreats imaginable. After all, a stay in this lovely, four-bedroom property comes with the attentive services of your private cook and housekeeping team. The only thing left for you to do is to explore the spacious grounds, head to the private beachfront or relax in the beautifully appointed interiors. Emphasizing a mix of Colonial and island design and décor, the property features spacious interiors that use a nice blend of bold hues to balance paler, natural colors. 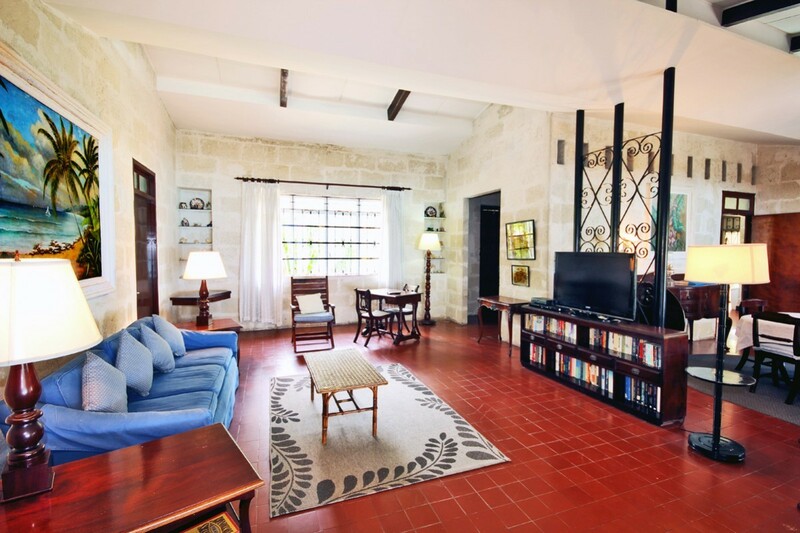 The red tiled floors and the white stone walls are great counterbalances in the great room area. Here you find the large family room with oversized seating and entertainment system. Nearby is the dining room furnished with elegant antiques and flooded with sunlight, and this in turn opens to the kitchen. The four bedrooms are divided between the two floors to ensure everyone has wonderful sea views and lots of privacy. There is a master suite on the upper floor with both sea and garden views along with a large, private bath. The lower level houses three king suites. One is ensuite with sea views while the other share a large bathroom and gaze into the wonderful garden spaces. Outdoor living spaces are also in abundance here and you may find yourself heading constantly to the cool and shady terrace that stretches along the waterfront. Like something out of a fairy story, it is made of stone and offers stunning sea views along with total privacy. With its incomparable waterfront location, its long list of premium services, and its gracious interiors, the Villa Clearwater is an ideal choice for a holiday with your closest friends or that unforgettable family adventure by the sea. Offering privacy and comfort, it is a wonderful spaces that can serve as your only destination while on the island, or as a luxurious base from which to experience all that Barbados has to offer. Clearwater is offering 10% off for travel between April 15, 2019 and June 30, 2019.